Unlock the Box - Turkey is in Trouble! Turkey needs your help! He doesn't want to be eaten by Farmer Jake and his family for Thanksgiving dinner! 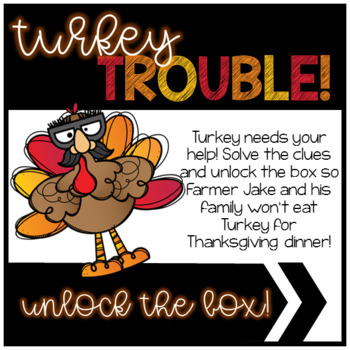 This "Unlock the Box" is based on the story Turkey Trouble by Wendi Silvano. Four puzzles are included for a whole group or small groups of students to work together to win the pizza coupon for Turkey! You will need 4 different locks (directional, 3-digit, 4-digit, and padlock with key), a hasp, and a lock box to complete this game. If you do not have these locks and do not wish to purchase them, I have also included a Google Form link as an alternative digital breakout! Some parts are EDITABLE so that you can make this "unlock the box" work the best for your classroom/content!